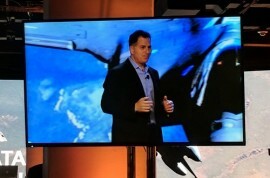 Dell Technologies is looking to leverage the various parts of the company into a new internet of things (IoT) strategy that focuses on the edge of the network, hyperconverged infrastructure at the middle, cloud computing in the data centre, as well as the end points picking up all the data, reports Enterprise Cloud News (Banking Technology‘s sister publication). At an event here, CEO Michael Dell spoke about how cloud computing helped create a new era of centralized computing akin to the early days of the mainframe. However, the increased use of IoT, along with machine learning and artificial intelligence (AI), is changing the model back to a distributed model. This is a model that requires much of the computing to happen on the edge, closer to the sensors and connected devices that make up the IoT ecosystem. Dell added that there will soon be 100 billion connected devices, which will then increase to one trillion before long, especially as computing nodes continue to drop in price. At the same time, there is a need for a middle part that can facilitate the management of data not only at the edge, but as that data transfers to the cloud for storage or further analysis. This is what Dell calls the “distributed core”, which leverages the company’s hyperconverged platforms of compute, storage and networking. At the core of this IoT strategy, whether it’s the edge, core, cloud or end device, is the massive scale that Dell Technologies can bring, including technologies and platforms from Dell EMC, VMware, Secureworks, RSA, Boomi and Virtustream. The emphasis on edge computing and the edge of the network is a trend IT infrastructure and data center providers are weighing. At the same time, the main hyperconverged companies are thinking about new approaches to IoT, especially industrial IoT where sensors are used in factories and manufacturing facilities but computing needs to remain close to the connected devices. An example of that is VMware Pulse IoT Center, an infrastructure management platform. The platform is made up of an agent that sits on the edge of the network that secures the device, encrypts the data and collects telemetry from the device and manages the software lifecycle of that device. At the same time, there’s a dashboard that offers a view of the entire network, including all the devices running off that network and on the edge. Another example is “Project Iris,” which is being developed by RSA and looks to use security analytics to protect devices within the core network, as well as those sitting out on the edge. Taken all together, Dell Technologies plans to leverage all parts of its business as part of this IoT strategy. In addition, the company will create a new group within Dell, the IoT Solutions Division, a clearinghouse for all these different IoT platform. VMware CTO Ray O’Farrell will head that new group as general manager. O’Farrell noted that IoT takes digital transformation to its essential next step. “As we are about to see, it’s another revolution, and this is going to be a revolution in terms of how they are going to leverage this whole world of the Internet of Things to fundamentally change what they are going to do. You can think of it as Digital Transformation 2.0,” O’Farrell told the audience. An example of this is AeroFarms, a “vertical” farming company that uses sustainable methods to grow food, including using LED lights within warehouses to grow row after row of crops during the year. During each crop cycle, AeroFarms collects some 130,000 pieces of data using Dell’s platforms, which equals out to millions of pieces of data every few months. In addition, Dell plans to invest $1 billion in IoT over the next three years. At the beginning of the show, the company’s venture capital group introduced five different startups that it has invested in over the last year and all have an emphasis on IoT, machine learning or AI. Dell is also offering consulting services, a partner network, as well as a group of three IoT labs located around the world to demonstrate its platforms. While IT departments fret about BYOD and Shadow IT, a new security beast lurks on the horizon–the shadow internet of Things. A swarm of consumer devices are all connecting to the internet and beaconing out data in different forms. Because they don’t look like computers, they aren’t treated like computers, and IT departments are often not managing them to ensure that they are secure.